Set your TiVos and VCRs! PEACE PARTY, the multicultural comic book featuring Native Americans, will appear in The War at Home Sunday, Sept. 24. "I'm proud that The War at Home chose PEACE PARTY to represent the diversity of today's comics scene," said Blue Corn Comics publisher Rob Schmidt. "As far as anyone knows, this is the first time a Native-themed comic book has appeared on national network TV." Titled "Super Dave," the episode revolves around two geeky boys dragging Dave, the unenlightened father, to a comic-book convention. Amid the colorful displays, they pass a booth decorated in PEACE PARTY posters and Indian paraphernalia. "Obviously viewers will get just a glimpse of the depth in our comics," said Schmidt. "But it'll be a pleasant change to see Indians as superheroes instead of savages, drunks, mascots, or casino owners." 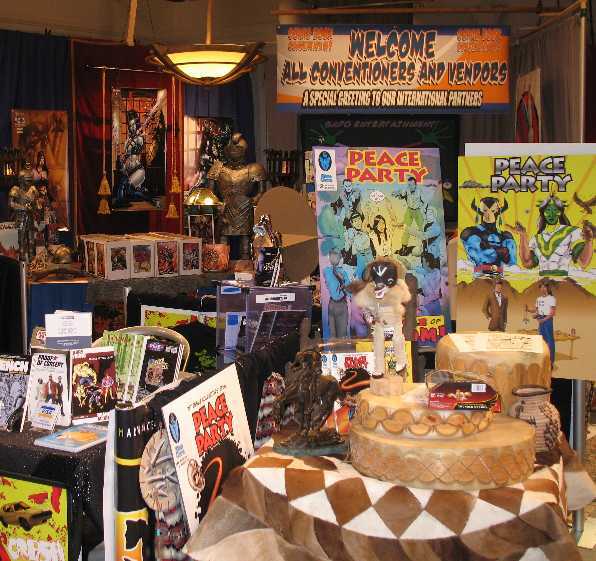 When a representative of The War at Home called Blue Corn Comics about using PEACE PARTY, she described her thinking. She said she had found PEACE PARTY on the Web (http://www.bluecorncomics.com) and was impressed with its multicultural message. She thought people needed to see more works dedicated to tolerance and understanding rather than hostility and violence. Besides, she said, big comics publishers like Marvel and DC already got enough attention in the media. It would be good to support a fledgling local company and give it some publicity. Thus the deal was set. The War at Home airs Sundays at 9:30 pm PST on the Fox network. Blue Corn Comics is presently working on a PEACE PARTY graphic novel for publication in 2007. For more information, visit BlueCornComics.com. Disclaimer: It's impossible to know in advance how long the scene with PEACE PARTY will be. In fact, the producers may have left it on the proverbial cutting-room floor.